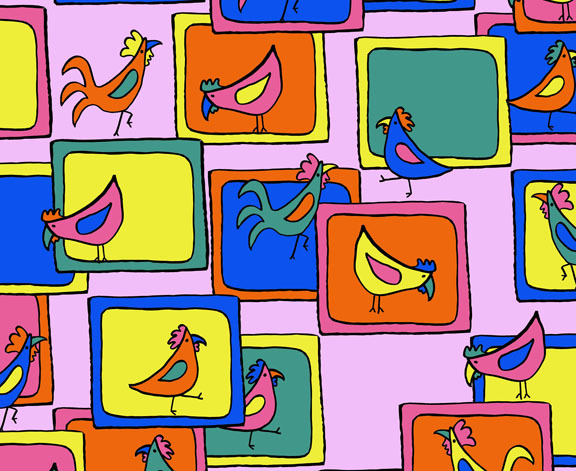 So, anyway, they have the fabric 8 competition next week, but I was initially uninspired by that theme, and decided I'd rather do the previous week's contest of pop art chickens. So, chickens! I used colors similar to Andy Warhol's screen prints. I don't really have much to say about it, other than it's adorable, and I want it to win. You can vote here. Scroll through the entries and the entries you click on you will be voting for. You don't have to sign up/in to vote. I am also entering the fabric 8 contest, but more on that in two weeks, I guess, when public voting starts. Provided I make it to the semifinals. So, I better work on my entry, huh?